The sky didn’t look bad behind us at the beginning of the ride. Here’s an adventure blog about what *not* to do. 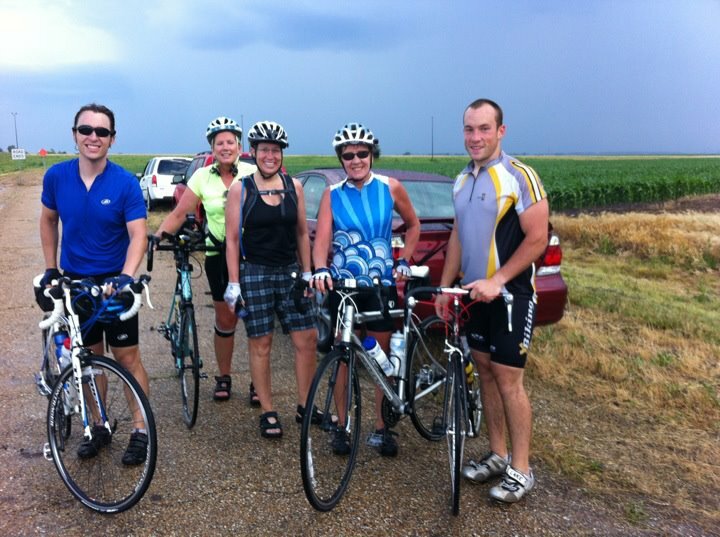 A few weeks ago, the Quincy Bicycle Club put together a little ride from Hull, IL to Payson, IL and back. It wasn’t a big deal- just a 35 mile loop (or something like that) was planned. Anyway, we packed up the car, headed to the starting point, and got on the road with about 25 other riders. The forecast called for wind and a 20% chance of scattered thunderstorms, but that left an 80% chance that we’d have no problem. You can see where this story is going. The ride to Payson was windy but uneventful, and I enjoyed hitting the road with my friends Karen, Jim, Rich, Ann and more. We did our usual thing, chatting and knocking out miles, and we were in Payson in no time. I went into the little café where we stopped to get some ice for my water bottles and to use the restroom, and that’s when the mistake was made. You see, off to the north, the sky had turned that foreboding shade of grey that we Midwesterners know well; a little squall was blowing in. We were going to be heading south though, and we decide if we hightailed it, we could beat the thing to our cars. I actually wasn’t part of the conversation about getting on the road (since I’d been in the bathroom at the time) but 7 people or so were taking off when I came out and I hurried onto my bike and followed them, as I also wanted to outrun the rain. Jim and Rich at a brief stop on the first half of the ride. We should have known immediately to head back to Payson and wait the thing out. The wind was ferocious and we were making decidedly little progress toward our cars. All the while, we watched a wall of dark grey slide alarmingly fast over the cornfields. The skies that were blue just moments before were closing in, and it was clear we weren’t going to avoid this thing. 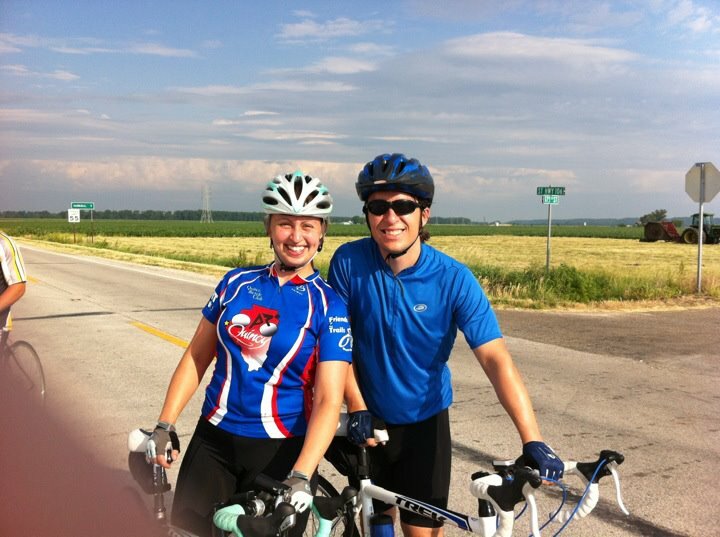 I dropped back to get with Ann and Rich Lentz so they wouldn’t get too far behind and I sent my husband ahead to tell the front fast riders to slow up a bit because we didn’t know the way back to the car through these country roads. And then the rain started. It was just a sprinkle at first, but pretty soon it was a full-on downpour. The rain was coming down so hard that it was tough to see the rider in front of you. 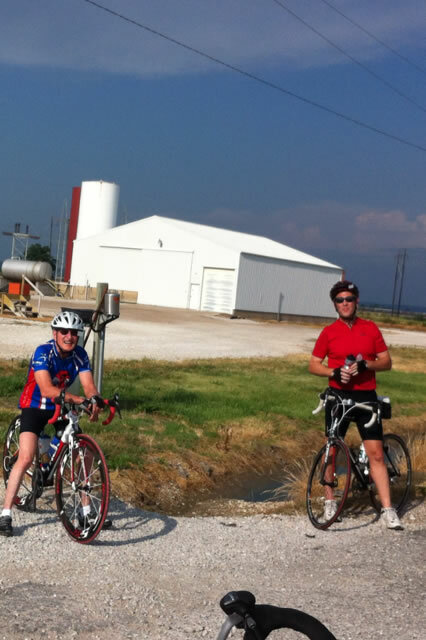 We were riding as fast as we could, but it couldn’t have been more than 11-12 mph due to the crazy wind. The rain wasn’t the worst of it, because a mile down the road the skies lit up with lightning. One bolt exploded so close to us that, at first, I was terrified that the front riders had been hit. It was the kind of thunder that shakes everything and makes all your hair stand on end. First Annual QBC Wet Jersey Contest?? After the storm. We regrouped for a moment at a turn on the route and I realized Ann and Rich weren’t behind us anymore. I didn’t know at the time, but they’d turned off the road to an abandoned barn to seek shelter. I couldn’t believe they weren’t there though and I screamed through the storm, “Oh my god I lost the Lentzes!” I still didn’t know the way back and we assumed they were not far behind us, so one of the other riders who was familiar with the area said she’d stay at the intersection and wait so they didn’t get lost. The rest of us went on through the driving rain. The 90 degree day had quickly become cold, water was sloshing around in my shoes, and the rain (and possibly small hail) hit us so hard that it stung. The ten miles to the car took far too long and it was miserable. And, because it’s how these things go, as soon as the cars were in sight, the storm dissipated and we were bathed in mocking golden sunshine that always follows a summer storm. About this time I checked the radar on my iPhone (er… probably should have done that before we left Payson) and noted the pencil-thin bow-shaped thunderstorm line we had just ridden through. Our route basically maximized the amount of time we spent in the storm by riding south and west into the thing. If we had just waited a half hour and had some breakfast (like the rest of the group did) we’d have been high and dry and not have had had our close brushes with being barbequed by the lightning. Everyone who was on this little ride was a-okay at the end, but it taught me some important lessons about cycling, namely: you probably can’t outrun the weather and lightning is serious business. 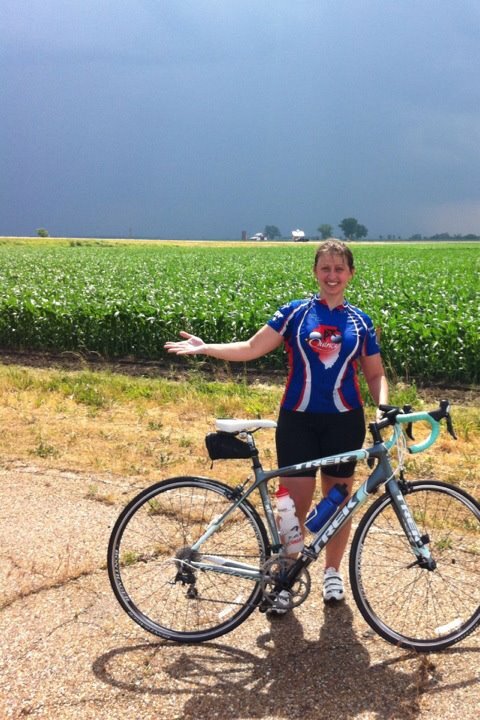 Living here, in the storm-prone heart of tornado alley, it’s good for we cyclists to take a moment and think about how we should react when (not if) a storm blows in and we are miles from home. I consulted some web sources including the League of American Cyclists, Traveling Two, Think Bikes, The American Red Cross and the National Weather Service and synthesized this list of storm safety tips for cyclists! Whenever possible, wait out storms in good shelter. Check the weather and radar before you hit the road. If you get caught in a lightning storm: stay away from trees and tall objects, avoid ridgelines, high hills or open fields. Basically, don’t be the tallest object around and don’t be near the tallest object around. Find the lowest elevation you can. Seek shelter when possible. Overpasses can be handy on a bike ride, but don’t be scared to ask a farmer/homeowner if you can wait the storm out in a barn/garage/shed. They don’t want to see you get hit by lightning either. THE EXEPTIONS to using highway overpasses for shelter would be if the overpass is made of steel (duh) or if you are sheltering from a tornado. Overpasses have been known to amplify wind effects of tornados and even stream debris faster. You’re better off in a ditch in this case. The websites I visited suggest getting in a low ditch, standing on the balls of your feet, putting your head between your legs… (and kissing your *** goodbye??) The scientific reason for this has to do with the lighting moving along the ground. Many times people who are struck by lightning are not actually touched by the main channel of the lighting, rather are zapped by the lightning traveling along the ground or through water. The fewer points of contact you have with the ground channeled lighting, the better. If you’re still riding to find shelter stay together, but not too close together. In the worst case scenario, if someone gets hit by lightning but you’re spread out on the road, not everyone will be hurt. If everyone is in a small group, they present a bigger target, a strike-prone high point, and everybody gets fried at once. Not good. Regarding getting to low spots: watch for areas prone to flash flooding. That’s not the low spot you’re looking for. Tornados: get low! Most injuries in tornados are due to projectile debris. Get in a ditch and stay there… and thank yourself for being smart and wearing a helmet every time you ride. After the storm has passed, use your common sense. Check for injuries, stay away from downed power lines, phone your family and let them know you’re okay. To determine if it’s safe to continue onward to your car or destination, the websites I looked at suggested the “Flash/Bang Method.” This method time can tell you the approximate distance you are from a storm by counting the time between the flash of lightning and the sound of thunder. You simply count the seconds and divide by 5. If you can count 10 seconds before you hear the thunder, the lightning was 2 miles away. 2 miles is the absolute minimum distance when you should consider hitting the road again, and the National Weather Service suggests a higher threshold of 5 miles or 30 seconds from the Flash/Bang Method. PS: Like I said, this list of safety tips was synthesized from the websites I listed and is neither complete nor definitive. It’s just a list of friendly suggestions from a fellow cyclist… not an expert. Please don’t sue me.